In their defense, the Israelis seem to have figured out the whole thing and opted out. But the hapless Palestinian leadership, along with their Arab League partners, joined by the French, EU and UN representatives, and even US Secretary of State, John Kerry, decided to play along. However, the French peace initiative-turned-conference in Paris on June 3 is nothing but a charade, and they all know it, Palestinians included. If you have been following the Middle East ‘peace process’ business in the last quarter of a century, you are certainly aware that the ‘negotiations table’ is nothing but a metaphor for buying time and obtaining political capital. The Israelis want time to finalize their colonial projects in building up illegal settlements on occupied Palestinian land; and the Palestinian leadership uses the ‘talks’ to acquire political validations from the so-called ‘peace-brokers,’ namely the United States. The US, in turn, uses the futile ‘negotiations’ to further assert itself as the caretaker of the Middle East, overthrowing regimes while simultaneously brokering peace. Meanwhile, every other relevant political entity is included or excluded based on its own worth to, or relationship with the United States. Thus, the honor of invitation is bestowed upon ‘friendly regimes.’ Others, namely, ‘enemies of peace,’ are rejected for their failure to accommodate or adhere to US foreign policies in the region. While the ‘peace process’ has failed to deliver neither peace to the region nor justice to the Palestinians, the ‘peace process’ industry has been an unenviable success, at least until 2014, when Kerry and the US administration decided to tend to more urgent regional affairs, for example, the war on Syria. By then, Israel’s right-wing Prime Minister Benjamin Netanyahu was too empowered by the anti-peace sentiment in his own society to even partake in the charade. There was little capital for him to be seen with aging Mahmoud Abbas, shaking hands and exchanging pleasantries. His right-wing constituency, which dominates Israeli society, could not have cared less. They were -- and are -- still busy confiscating Palestinian land, issuing more racist laws in the Knesset and fighting dissent among their own ranks. Prior to that date, and since the very first peace conference in Madrid in 1991, the ‘peace process’ has splendidly paid dividends. The Israelis were finally accepted as a ‘peace partner’ and Israel slowly made its way from the margins of the Middle East to the center, without having to concede an inch. Considering his ‘chief’ position in the travesty, why did Erekat agree to help maintain the misapprehension of peace considering the price that was paid in lost land, time and lives? Well, because the Palestinian leadership itself was at the forefront of raking in the benefits of the spurious peace. The ‘peace process’ meant money, and plenty of it; billions of dollars invested in the Palestinian Authority -- feeding a dead-end political system that existed with no real authority, and almost always remained on the sidelines as Israel used extreme violence to sustain its colonial enterprise in the West Bank and Occupied Jerusalem. The PA even stayed aside as Israel battled the Resistance in Gaza, killing thousands of civilians and besieging an already highly-populated and economically-devastated region. Alas, in the last ten years, it seems that Palestinian leadership and factions invested more energy to nurse their own internal strife than to confront the Israeli occupation. The French government has its own reasons for taking the lead on reviving the dormant peace talks and, no, those reasons have nothing to do with French desire to create a more equitable platform for talks, as Palestinian officials conveniently allege. Writing in Israel's Arutz Sheva, Eran Lerman explained the French endeavor in more practical terms. “Broad regional security considerations” are driving the French diplomatic initiatives, he contented. In fact, the logic behind this is discernable. French President Francois Hollande's approval ratings are at an all-time low. As of March, he broke his own record of low approval, sinking to 17 percent. (In October of last year it stood at 18 percent). His country is embattled by violence, massive strikes, and terrible foreign policy decisions that resulted in French military involvement in Libya, Mali and Syria. Leading world leaders in another peace gambit that is helping distract from the US failure on that front is a clever political calculation from the French perspective. It might even help Hollande appear stately and in charge. The Israelis rejected the initiative right away, without even bothering with a public diplomacy campaign to defend their position, as they often do. Dore Gold, director general of Israel’s Foreign Ministry, repeated on the eve of the conference what Netanyahu and others have parroted for weeks. The conference will “completely fail,” he said, calling on Abbas to engage in direct talks with no prior conditions instead. The conceited Israeli response to the French conference was paralleled with euphoria among the embattled Palestinian leadership. That, too, is understandable. The PA subsists on this sort of international attention, and since the last major meeting between Abbas and the former, now-jailed Israeli Prime Minister Ehud Olmert in 2008, Abbas is left on his own, disowned by the Americans and neglected by Arab governments. Even if -- and when -- the long-awaited ‘resumption of negotiations’ arrive, nothing good is likely to come out from it, except for political dividends for those who have participated in the 25-year gambit: buying time and acquiring more funds. There is nothing to celebrate about this. Secretary of the Palestine Liberation Organization (PLO), Dr. Saeb Erekat, denounced Tuesday the visit of Israel’s President Reuven Rivlin to illegal colonies, built on Palestinian lands, east of the central West Bank city of Ramallah, and said the visit constitutes a direct support to apartheid, and a violation of every related international agreement. He also called on international community to hold Israel accountable for its constant and escalating violations, instead of allowing it to remain above all laws, committing crimes with impunity. The official added that this visit, the first of a sitting Israeli president to colonies in the occupied West Bank, comes as a deadly strike to the French peace initiative, and all international efforts to reach a comprehensive agreement. 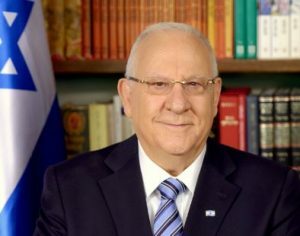 Israeli media sources said Rivlin visited the Benjamin Regional Council of Settlements after he was invited by its head Avi Roeh, who also chairs the Regional Council of Settlements in the occupied West Bank. After being welcomed by various officials, especially heads of Israel’s illegal colonies who confirmed the strong ties with him, Rivlin said that all of the West Bank, including East Jerusalem, are part of the “Land of Israel,” and called on all Israelis to visit the settlements. 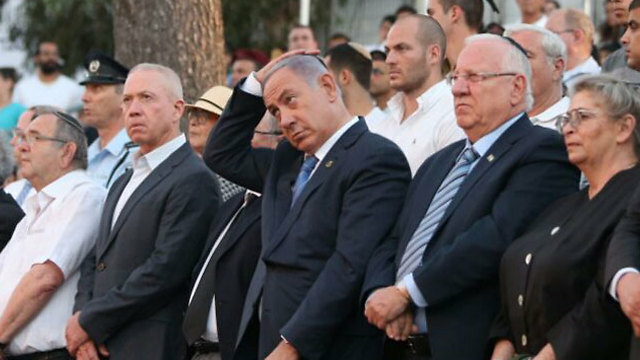 Rivlin is a member of the Likud Party headed by Israeli Prime Minister Benjamin Netanyahu. In a familiar muddying of the waters, Israeli prime minister Benjamin Netanyahu has spent the past week talking up peace while fiercely criticizing Friday’s summit in France – the only diplomatic initiative on the horizon. Earlier, Netanyahu and his new defense minister, the far-right Avigdor Lieberman, had publicly committed themselves to an “unceasing search for a path to peace”. In a two-minute interview on CNN, spokesman David Keyes managed to mention the formula “two states for two peoples” no less than five times. Rather than the French initiative, Netanyahu averred, Israelis and Palestinians should be left to engage in the kind of face-to-face talks “without preconditions” that have repeatedly failed. That is because Israel, as the much stronger party, has been able to void them by imposing its own conditions. Netanyahu, it seems, is keen on any peace process, just so long as it’s not the current one launched in Paris. Part of the reason for bringing Lieberman into the government was to provide more diplomatic wriggle room. With Lieberman cementing Netanyahu’s credentials with the far-right, he is now free to spout vague platitudes about peace knowing that his coalition partners are unlikely to take him at his word and bolt the government. But while the domestic front has been secured, rumbles of dissent reverberate abroad. Europe is increasingly fearful that an emboldened Israeli government may soon annex all or major parts of the West Bank, stymying any hope of creating even a severely truncated Palestinian state. 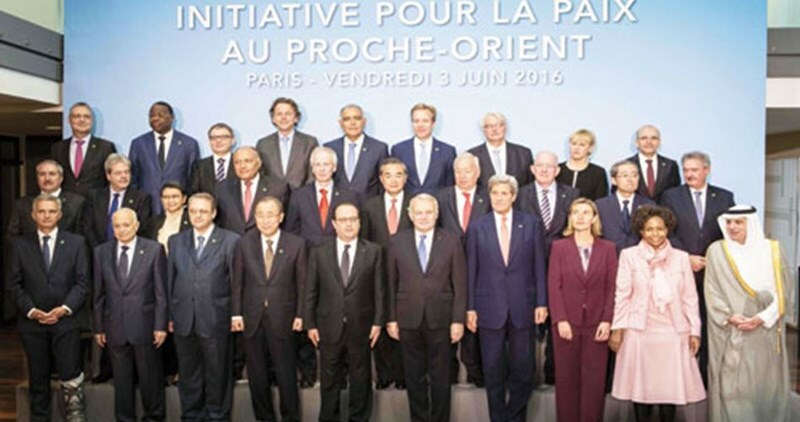 The Paris conference is a sign of the mounting desperation in Europe to restrain Israel. While France is not about to engineer a breakthrough, Netanyahu is nonetheless worried. It is the first time Israel has faced being dragged into talks not presided over by its Washington patron. That risks setting a dangerous precedent. One way might be for Washington to agree to French oversight of the talks, following a tight timetable and establishing diplomatic “teams” to solve final-status issues. Even if negotiations fail, as seems inevitable, parameters for future talks might be established. Netanyahu also knows that the wider atmosphere is likely to leave him singled out as the intransigent party. A report by the Quartet, due soon, is expected to criticise Israel for its past failure to take steps towards peace. And a report last week by a joint team of US and Israeli defense experts suggested Israel’s “security concerns” about Palestinian statehood are not as intractable as claimed. Israel’s sudden interest in the plan is odd, given that it has not been discussed in cabinet since the Saudis unveiled it 14 years ago. In truth, Netanyahu backs the idea because he knows reaching a region-wide agreement would be impossible with the Middle East in turmoil. 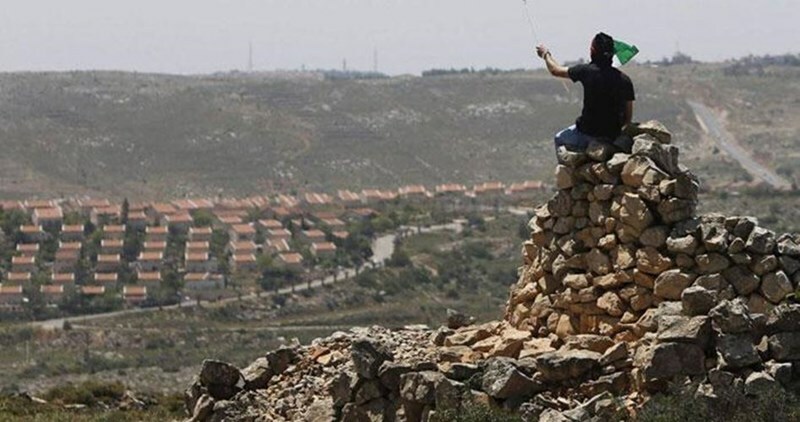 The Israeli municipality's planning and construction committee in Occupied Jerusalem on Monday authorized the marketing of the 82 housing units in Ramat Shlomo settlement despite the government's objection and without notifying it, Israel's Channel 2 claimed. Ramat Shlomo is an illegal settlement located in northeast Jerusalem, next to the Palestinian village of Shuafat. A diplomatic crisis erupted between Israel and the US in March 2010 due to the former's plan to build 1,600 new housing units in the settlement, coinciding with US vice-president Joe Biden's visit to Palestine in order to push for renewed peace talks. The European Union was also critical of the plan at the time. The Jerusalem municipality said in response to Channel 2's report on Monday that construction in Jerusalem is "necessary, important and will continue with full force." It stressed that it would never freeze settlement construction in Jerusalem again and would approve similar plans with or without the consent of the Israeli government. Hamas and Islamic Jihad Movements called Monday for holding a comprehensive Palestinian dialogue to end the internal division, achieve a real national unity, and adopt a national strategy to confront the Israeli occupation. In a joint statement, the two groups stressed “the importance of coordination and inter-communication between Palestinian resistance factions at home and abroad for protecting the Palestinian cause from liquidation projects, the last of which was the French initiative”. 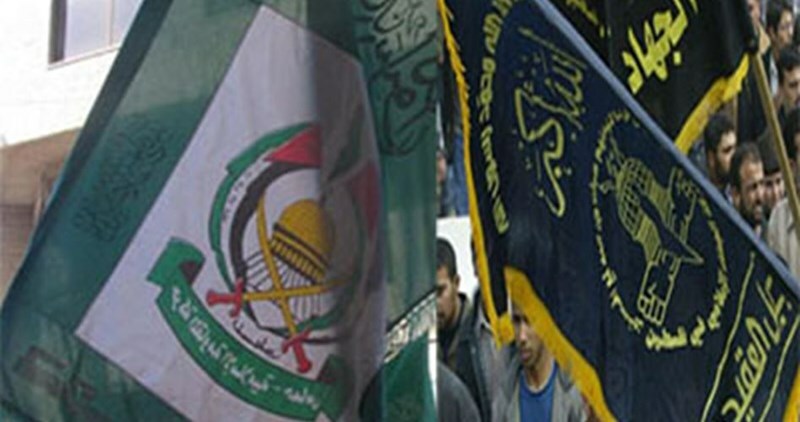 Deputy head of Hamas’s political bureau Dr. Mousa Abu Marzouk had met Sunday with secretary general of Islamic Jihad Movement Dr. Abdullah Shallah in Beirut for an in-depth discussion of Palestinian developments mainly the national reconciliation, Jerusalem Intifada, Gaza siege, and the Arab and Islamic support for the Palestinian cause. France hosted last week an international conference on the Israeli-Palestinian peace process with the participation of 30 states and international organizations. The one-day peace summit in Paris, to which the Israelis and Palestinians were not invited, concluded on Friday with a call for an international conference on the issue before the end of the year. The Israeli Jerusalem municipality announced its intent to build an illegal settlement outpost comprising 15,000 units in the Qalandiya Airport area, renamed Atarot. “Such an intention has always been there. I am determined to make it come true,” he added, calling on the Israeli Prime Minister Benjamin Netanyahu and the Housing Ministry to back up the settlement plan. According to Turjman, the new settlement neighborhood is expected to be ready within four years. The Qalandiya Airport area, along with other West Bank zones and East Jerusalem, were occupied by Israel following the 1967 six-day-war. At ceremony marking 49th year since the city's unification Netanyahu states that placing Israeli flag above Western Wall was 2nd most important moment after declaration of independence; President Rivlin: Prophetic vision became reality, Jerusalem returned to its children. "49 years ago, Jerusalem was released from its shackles. 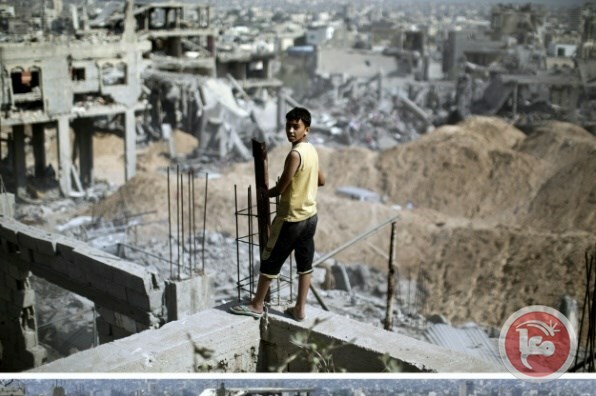 We will not return to a reality whereby the city is torn, divided, and wounded," Netanyahu said. President Reuven Rivlin also spoke at the ceremony, and called on the government not to empty the city of its symbols, touching upon the issue whereby government ministries are moving out of Jerusalem. The ceremony took place on Mt. Herzl and was attended by IDF Chief of Staff Gadi Eisenkot, Police Comissioner Roni Alsheikh, and various government ministers and mayors. The ceremony began with torches being lit by various representatives of the IDF regional commands to remember those who fell trying to liberate the city from the Jordanians. Netanyahu also shared his memories of Jerusalem and said that the current, magical reality was at one time very different. 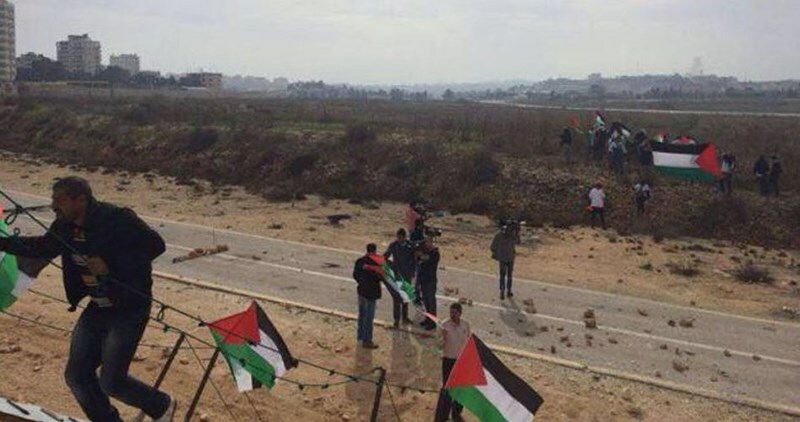 "It was a reality of huge concrete walls with snipers on top, no mans lands and minefields," Netanyahu said. He continued saying, "The veterans here remember what the soldiers wrote on the military vehicles – 'there will not be a second Auschwitz, and there will not be a second Masada.' I remember the feeling of threatening danger and adrenaline and the spirit of our fighters, which thanks to them, our situation changed from one side to the other. This was proven once again – that the only way to guarantee our existence is our presence and ability to defend ourselves and to protect the security of the state of Israel." Netanyahu, who is flying on to Moscow on Monday, said that "placing the Israeli flag on the Western Wall was the second most important moment after the declaration of the State of Israel. This spiritual ascendance encompassed the entire nation, both in Israel and in the Diaspora. It was at that moment that a national consciousness was launched amongst Jews in the former Soviet Union." "Tomorrow, I'm flying to Moscow to mark 25 years of relations between Russia and Israel. But on the eve of the Six Day War, the armies which surrounded us were all armed and funded by the USSR. Russia is a global power, and our relations are getting stronger. The strengthening of this relationship strengthens our national security and prevents unnecessary friction on our northern border." The prime minister also referred to the peace process and said that nobody would force upon Israel international dictates. "Peace is achieved through direct and free negotiations between the parties. We've seen it with peace with Egypt and Jordan. It was not achieved by international dictates. 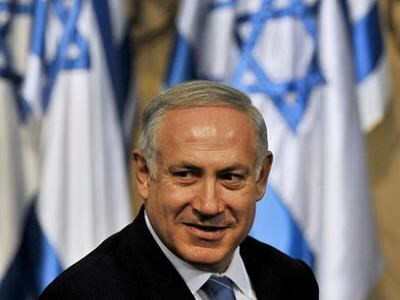 In the period after the Six Day War, when the military campaign was over, the political campaign began," said Netanyahu. "The same players in the international arena who did not lift a finger to help us when the threat of destruction hovered over us were those who tried to impose a political settlement on us. It did not work then and will not work today. Any international dictate hardens the Palestinians’ positions. Anyone who denies our connection to Jerusalem, transforms the Temple Mount into a center of religious incitement, who does not renounce terrorism - still has a long way to peace. " The Israeli government has expressed indirectly its satisfaction with the closing statement that was released by the Middle East peace conference held in Paris on Friday. According to Israel's channel 10, a senior government official said, on condition of anonymity, that the closing communique of the Paris conference did not include any references to the 1967 borderline of the Palestinian state or Jerusalem as the capital of Palestine. He added that the conference also did not demand Israel to take instant steps towards the peace process. The official also pointed out that the statement included only a call for the Palestinians and Israelis to return to the negotiating table. The channel affirmed that the soft and satisfying tone towards Israel in the statement was the result of concerted diplomatic efforts made recently by Tel Aviv to convince American and European officials to refrain from crystallizing decisions against Israel's will. However, the Israeli foreign ministry deplored the Paris conferees for not demanding the Palestinian president to engage in immediate peace talks without prior conditions in response to calls made by Israeli premier Benjamin Netanyahu in this regard. The ministry said that the Paris conference contributed to hardening the Palestinian position further and made the peace more un-achievable.